The same day I purchased a copy of Greywalker at the GoodWill, I also picked up Charlaine Harris’ book, Dead Until Dark. This is the first Sookie Stackhouse book … a blending of the mystery and light horror genres that not only led to a series of at least nine books, but also the hit HBO original series, TrueBlood. My first impression is of the cover … it really bothers me. 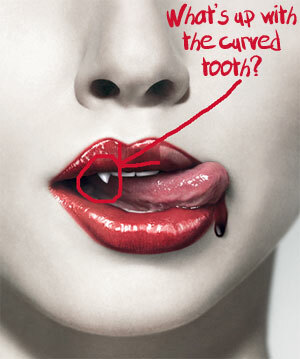 That fang is not only in the wrong place (it is an incisor rather than a canine), but it curves oddly inward. Part of that weirdness was solved when I saw an episode of TrueBlood when I was on vacation (I don’t get HBO) … these TV vampires have their fangs where their incisors are, unlike pretty much every vampire I’ve seen on TV and film before that place the fangs where the canines are. So I’ll let that one go. But what’s up with curving in? Even in the show they are straight! And that curve would make it harder for this vampire to break skin properly … it would be a messy deal and she’d loose some of that blood she was going for. Anyway, enough about the cover and on to the book review. I can see why the Sookie Stackhouse novels have been so popular. The characters are fun, interesting and fleshed out. The mystery is compelling. And … there’s just enough dose of romance to bring in the female audience without totally alienating the male audience. In Dead Until Dark, we are introduced to Sookie Stackhouse, a waitress at a small town bar in the South. She pretty much keeps to herself … mostly because she can read other peoples thoughts and the chatter can be annoying and, at times, offensive. Anna Paquin (Rogue from the X-Men movies) brings the character of Sookie Stackhouse to life. 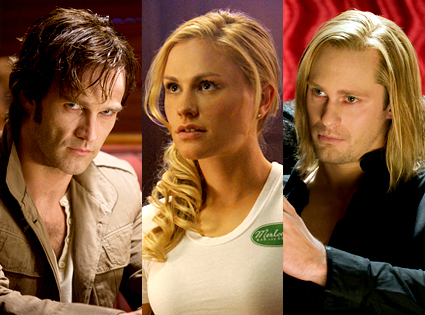 Shown here with Stephen Moyer as Bill (left) and Alexander SkarsgÃƒÂ¥rd as Eric (right). But the opening line of the book really sets the tone: “I’d been waiting for the vampire for years when he walked into the bar.” From that point on, you realize you are not in Kansas anymore. Nope, you’re now in a world where vampires have civil rights. They’ve convinced enough people that they aren’t supernatural at all … just victims of a virus … that they can now walk with their undead heads held high (well, sort of). After Sookie rescues Bill Compton (the vampire) from some rednecks that sell vampire blood on the black market, she is drawn into a a relationship with Bill and, whether she likes it or not, the bizarre supernatural world he’s trying so hard to leave behind. But then women who have had “relationships” with vampires are dropping like flies and Sookie is next. The killer has already killed her grandmother in his attempt to get at her. Can Bill keep her safe? And what about the older vampire, Eric, who has taken an interest in Sookie? Oh, and then there’s Bubba … the mentally challenged vampire who has a thing for cats and goes crazy if you call him by his once human name (it rhymes with pelvis). Was this book deep? Not really. But it was a very entertaining read and I hope to pick up more books in the series the next time I stop by the GoodWill. Just submit your post to my facebook, cant wait to share this.Think all of my folks will see this…Thanks.